The name parvimaculata refers to the small size of the speculum (mirror) on the lip of this orchid. The plant grows up to 40cm and each inforescence carries up to 7 large flowers. The petals and sepals are white or yellowish and the lip of the flower is rounded at the top and then somewhat tapered at the tip. The mirror is reduced in size and covers barely a quarter of the surface of the lip. 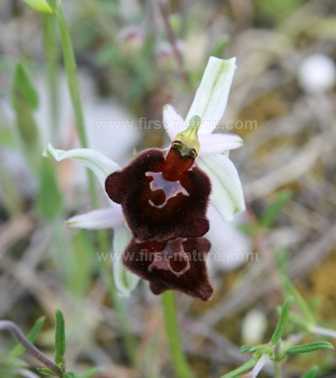 This orchid is endemic to the southeast of Italy (from Foggia to Lecce). It is rare and localised. Although it grows in short grassland on alkaline substrates, unlike many of its close relatives that thrive in full sunshine, this orchid prefers a slightly more shady habitat. The best places to look are in light or open woodland, particularly if there are oak trees present. Ophrys parvimaculata flowers during April and possibly into very early May depending on the seasonal temperatures. This specimen on this page was photographed in open woodland close to Monte Sant'Angelo on the Gargano Peninsula in Italy in mid April.